It was posted in March and already has 5 comments. 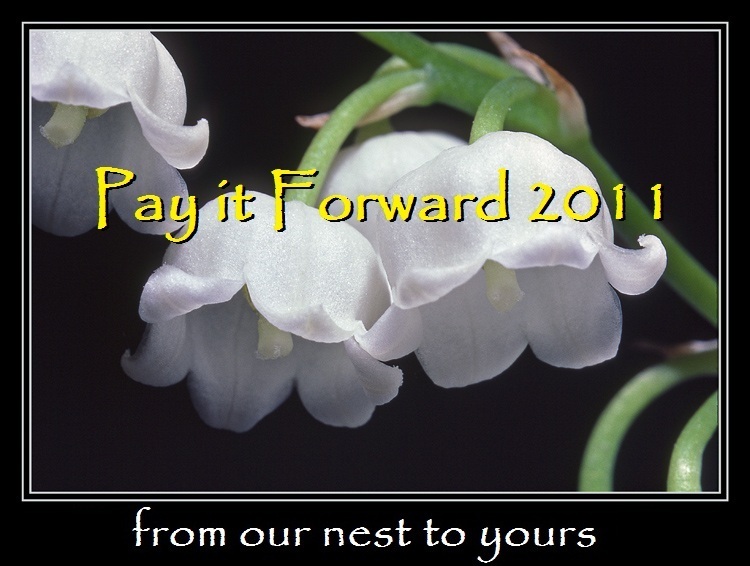 but who's to say I can't continue Pay it Forward anyway? will receive a gift handmade by me. There is an important catch..
explaining Pay it Forward 2011.
who commented on your post who agreed to do the same. As long as you get your gift to them this year..
Also, your gift doesn't have to be elaborate or difficult to make. It can be as simple as a bookmark or whatever you can and have time to make. This should be a fun way to share your creativity. but more of my blog followers do not have a blog. And I would like to include them as well. and make gifts for the first 5 people who agree to do the same. If you are a friend who follows my blog with out "following"
Yelena I love this idea! I will be working on a post and hopefully some kind people will continue it on. I'm in. Can't wait to give this a try. Sis- you're site is awesome.. and the chickadee comments are adorable. I miss you guys!